Remember the old fruit slots where you get paid out very little for your winnings, even though it was loads of fun to play? JackpotCity Casino has reinvented the fruit slot machines and added something spectacular – a spinning bonus wheel. Now you can still have loads of fun and enjoy big winnings in Wheel of Wealth Special Edition. Wheel of Wealth Special Edition is an online slot filled with rich symbols: a plane, a sports car, a diamond, gold bars and a stash of cash. There are also the fruit symbols that everybody loves: watermelon, orange, lemon, cherry, apple and grapes all form part of this special edition video slot. Then there’s the Wheel of Wealth symbol which will substitute for all the other symbols, except the Bonus and the Scatter. Not only will it double your win when it substitutes, but if you get 5 of these symbols during a single spin you can also pocket 10 000 coins. 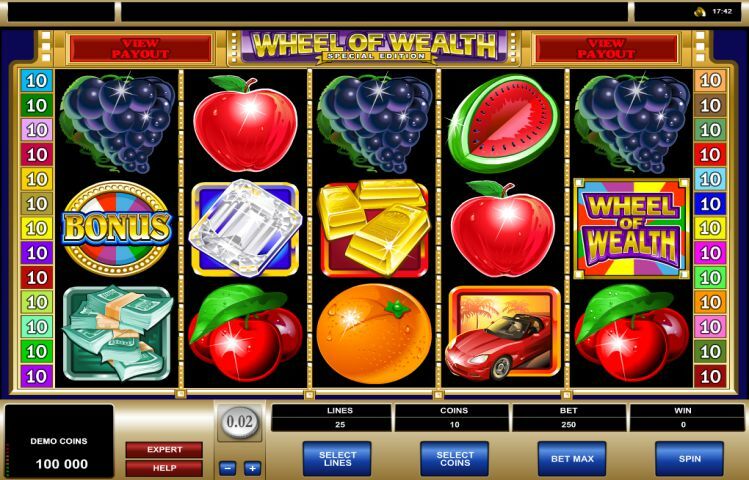 Five paylines and 25 reels are what you will find on the Wheel of Wealth Special Edition online slot. You can wager 10 coins per payline from as little as 0.01 to 0.50. If you bet the maximum of 125 coins, winnings of up to 50 000 coins are possible during regular play. The symbols are paid out according to the paylines, except the Scatter which will reward you with up to 200 coins when it lands anywhere on the reels, but you need to get at least 2 of these symbols to score. The real fun starts with the Bonus symbol which will activate either the Reel Bonus or the Wheel of Wealth Bonus. Should you get at least 3 of these symbols, you will be taken to the bonus screen where you need to choose one of three symbols – this is the Reel Bonus. Two of the symbols will hold a cash prize which will be added to your winnings and you will then return to regular play. If you choose the symbol with the word Spin hidden, you will be taken to the Wheel of Wealth Bonus, where you’ll have the chance to spin the wheel for a guaranteed prize – winnings of up to 100 000 coins are possible during this round. Wheel of Wealth Special Edition can be played at JackpotCity Casino, and if you’re a fan of spinning the wheel you can also try the 3-reel slot, Spectacular Wheel of Wealth. There are more than 400 slots to choose from at JackpotCity, but nothing like the Wheel of Wealth editions, so give it a spin today. And if you register your account for the first time, JackpotCity will reward you not only for your first deposit, but for your first four deposits at the casino. That’s right, you will get a 100% match bonus worth up to 400 credits each on your first four deposits. The Wheel of Wealth Special Edition online slot is definitely worth playing and JackpotCity is without a doubt the best casino where you should play.